Internal flights in Burma have not a got a great reputation, especially after the crash near Inle Lake on Christmas Day, and the anxiety starts early. When we reached the Domestic terminal, we got given a little coloured sticker to wear that indicated our flight. 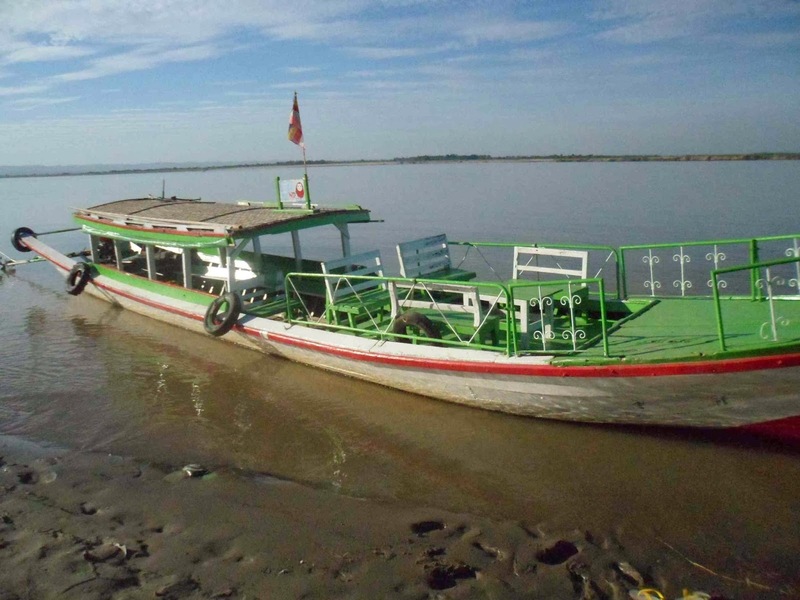 We soon discovered why – there was no departure board, and only hugely distorted announcements which could have been in Burmese or English or Aramaic for all we knew. We then realized that when a flight was due to go, a man came round the room with a little sign, shouting out the flight number and destination. The passengers with the right stickers then traipsed after him onto the tarmac like the Pied Piper, leaving behind anyone foolish enough to go to the Gents at the wrong time. So we held it in and waited. But the time for our flight came and went and anxiety started building, so we started looking round for people with our sticker, exchanging encouraging comments, and ganging up. 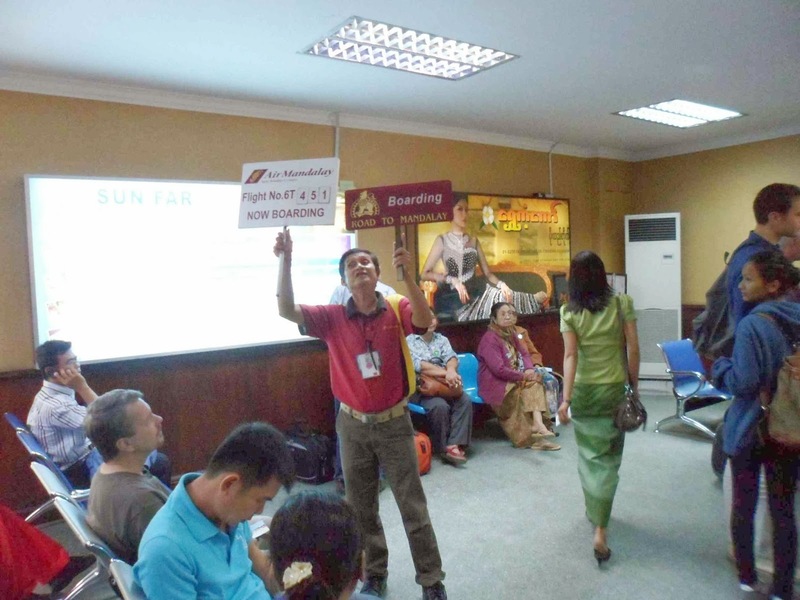 Our fortitude was rewarded when our rep came bellowing out, and we all trooped out feeling like we were taking the last flight our of Saigon, under the envious gaze of the other travellers left crammed in the terminal,. Some are probably still there waiting. Hot, dusty, very peaceful. Being shown round a small monastery, with caves where the monks slept on bare beds. 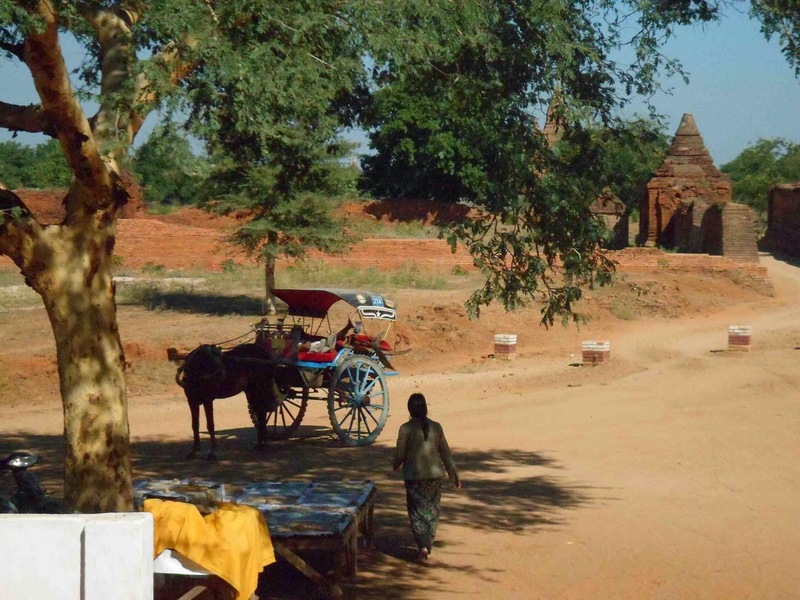 We had cycled down to Old Bagan to catch some final temples, had got distracted by a lacquer works and needed to get back to our hotel. 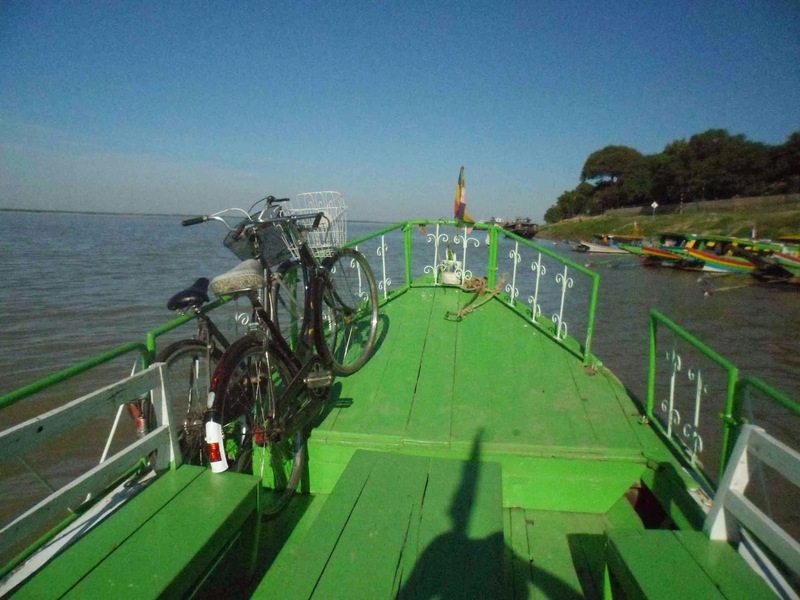 I was not looking forward to the ride back in the baking mad-dogs-and-englishmen midday heat, and also regretting not having left time for a boat trip on the river, and Kate had the brilliant idea of combining the two. So we went down to the jetty and haggled with a man who said he could take us and our bikes up river to Nyuang U near our hotel. 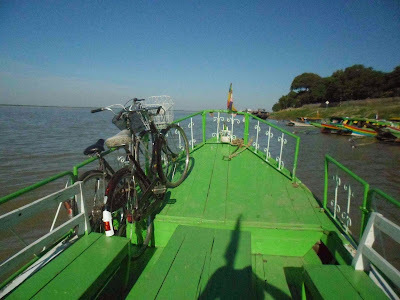 We had expected a shabby little tub, but instead got ushered through the refuse and mud to a very large, although still shabby, tub where we sat in splendour with our bikes, I and the Memsah’b. 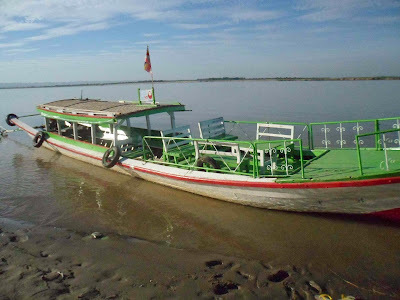 The Irrawaddy here is huge and full of sandbanks and so it clearly took skill for the small boy to navigate upstream. Very peaceful, that is apart from the deafening noise from the engine on a pole, the whole engine being moved as he steered. This was where the British Indian Army crossed in February 1945 when re-capturing Burma, finding themselves confronting the Indian National Army who were fighting with the Japanese. 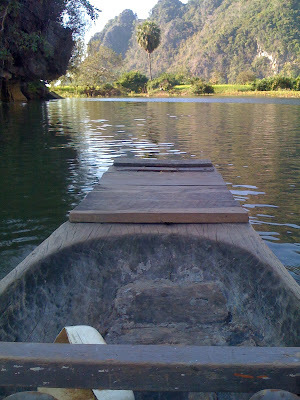 Then at Nyaung U we dumped our bikes over the side and pedaled back to our hotel, feeling rather pleased with ourselves. And also feeling that 30 minutes on the Irrawaddy was enough for a while. The Golden Rock at Kyaitko is a major Theravadan Buddhist pilgrimage centre and 3 visits in a lifetime earns a lot of merit. The rock is at the top of a very steep hill, with a single winding road. A constant stream of trucks roar up this hill at great speed, each with around 40 pilgrims sitting in rows on padded benches with no protection against rain or sun. 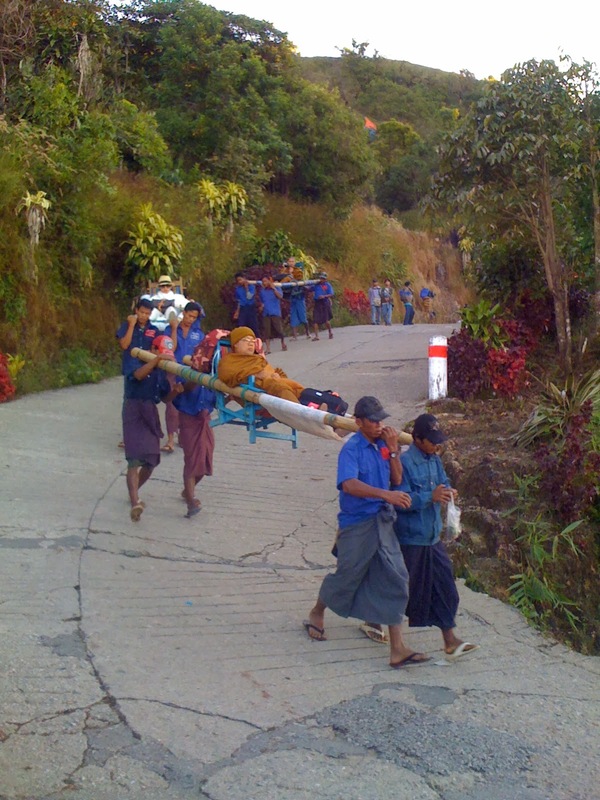 It’s very smoothly organised – the trucks line up in the shade in Kinpun at the bottom of he hill, with stepladders along the side, and after each fills up it starts off. The day we went up was the one day of the year when the trip is free, and it took about 20 minutes, hanging on as we hurtled round hairpins - fortunately they operate a one-way system. Great fun, lots of laughing and cheering at particularly exciting bits. The Golden Rock turned out to be impressive, but the pilgrim Disneyland around it was even more extraordinary – lit up like a fairground, full of festive pilgrims. 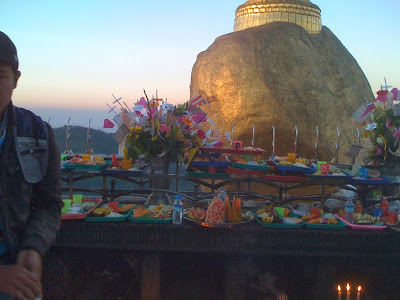 We were staying around 20 minutes walk down the steep hill, and our hotel was popular with rich Thai pilgrims as each walk up the hill counted as a separate visit, and so all three could be achieved in a weekend. Palanquins were available for hire, which provide good employment but would have been seriously embarrassing. Many westerners were using them, possibly as part of a package trip, but some clearly felt like we did and even when it was provided just got their bags taken up. Embarrassing way to travel. For some. 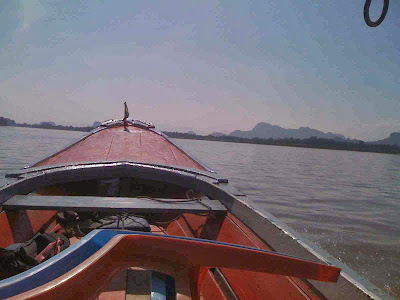 Hpa-An was around 60 miles from Kinpun, but we got pointed to a pick-up. This was an old Nissan, which must have been clapped out when it left Japan but was still going sort-of strong. These pick-ups carry crowds of people and massive loads on the roof, often with more people top of the load. 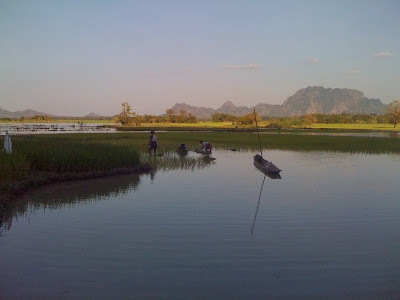 Having already travelled in some crammed pick-ups, we did not fancy 3 hours of this and so paid extra (7,000 Kyat, £5) for a front seat next to the driver, which was hot and possibly more dangerous. The pick-up was right-hand-drive as nearly all vehicles are in Burma – which is unfortunate as they also drive on the right. So I could see all the traffic coming towards us as we did our over-taking. I tried to attain a higher mental state. Kate sat in the middle, and the immaculately polite driver was so conscious of her presence that he refused to use 2nd gear as it would have needed her to move her backside, and so we always went from 1st straight to 3rd. We tore along, horn blasting to pick up customers, and then diverted to a rice works where we filled the roof with sacks until the suspension hit the ground. Shouldn't there be some sort of Society for the Prevention of Cruelty of Vehicles? Then we stopped again and filled half the back with large barrels full of water and live fish, so that the whole vehicle developed a strange rolling motion and an almost complete inability to stop. 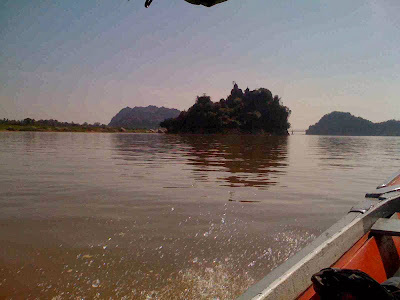 But we got to Hpa-An, dropped outside the legendary Soe Brothers Guest House, and went to our double room with bathroom ($16). We entered a large cavern full of shrines, and then put our shoes back on to continue in pitch-black through a cave system in the limestone. We came out into daylight above a calm lake, with views over the paddy fields to the mountains. Our driver negotiated with the locals standing next to their log-canoes, and with some careful balancing we set off over the lake, where they also were trying to catch fish with drop-nets as in Cochin. A short trip, then in under the cliff, quiet paddling in the dark until we came out into another lake, fishing nets, paddy fields. The locals were continually talking and laughing with themselves and our driver, giving a wonderfully peaceful and good-natured feeling to the whole setting. Magical.